Handmade Earrings Necklace: Triple Strand necklace with Swarovski crystals and pearls and a smattering of earth-loved gemstone – what could be more soothing to make. 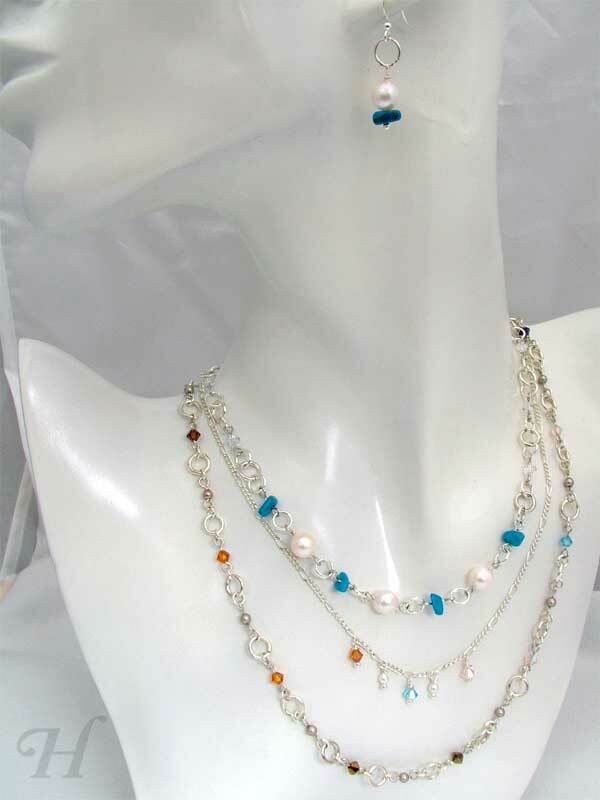 Quite a charmingly elegant set of necklace and earrings – this was a peaceful set to work on. I always love wirework and making loops so I think I was really wanting to soothe myself by making a hand-looped chain. 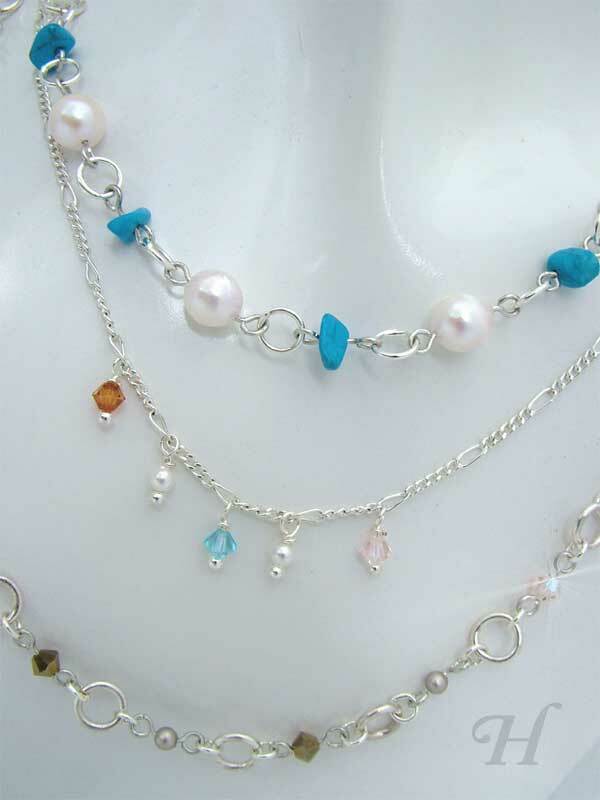 But just a chain necklace would be too boring for me to make so in crept the crystals, pearl, and gemstones. And the colors that selected themselves turned out soothing while in the process as well in the final outcome. 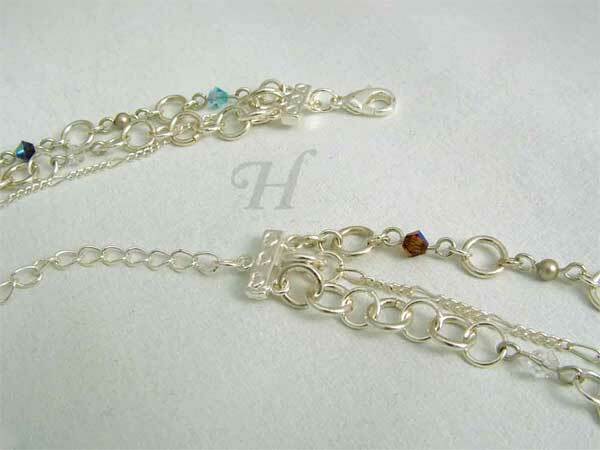 Each chain was made and then attached to a triple bar clasp – staring with the longest chain. 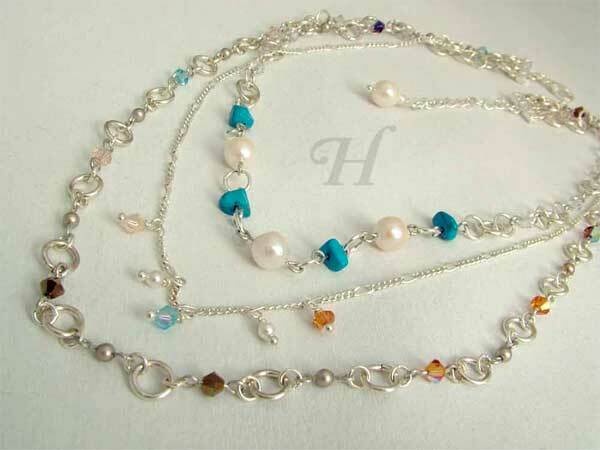 The bottom chain – make double-looped bead (Swarovski pearls/crystals); each loop connects to a close small jump ring before finished each loop. A larger ring joins in between. 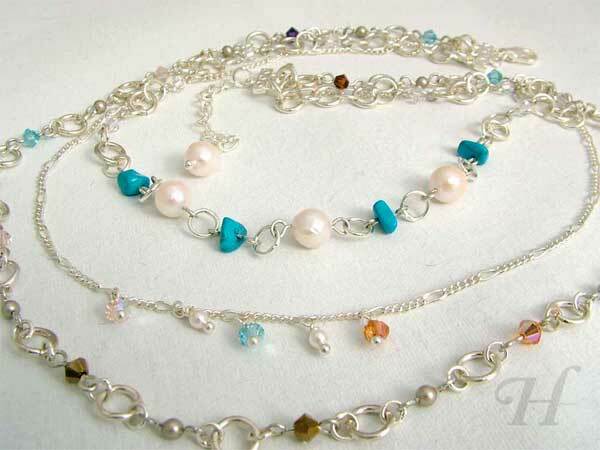 Middle Chain – make little drops with Swarovski crystal/pearls using ball headpins. The loop is attached to chain before closing off. (The chain is a purchased chain which I chose for its fineness to go with the overall look). 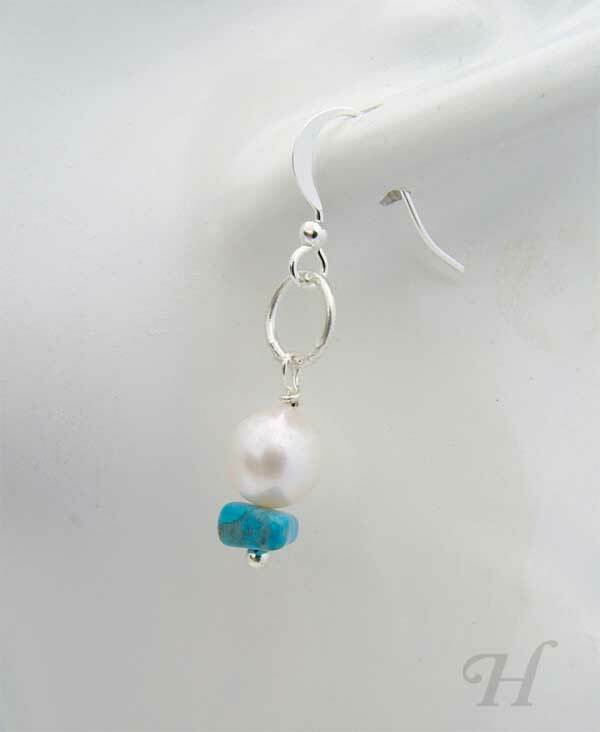 The top/shorter chain is slightly more dramatic using larger Swarovski pearls and turquoise nuggets. Though it is not so clear from this image, there is a drop (pearl drop) at the end of the clasp. This seems to make the putting on/taking off process much easier. Though I am usually quite lazy after finishing a piece – or rather, I am eager to move on to the next project /design, this time I made myself stop and contemplate the making of a matching set of earrings. And what eventuated was quite simple and fits the look of this necklace, earrings set. I am selling them separately though – only because I think some people might just want one or the other. 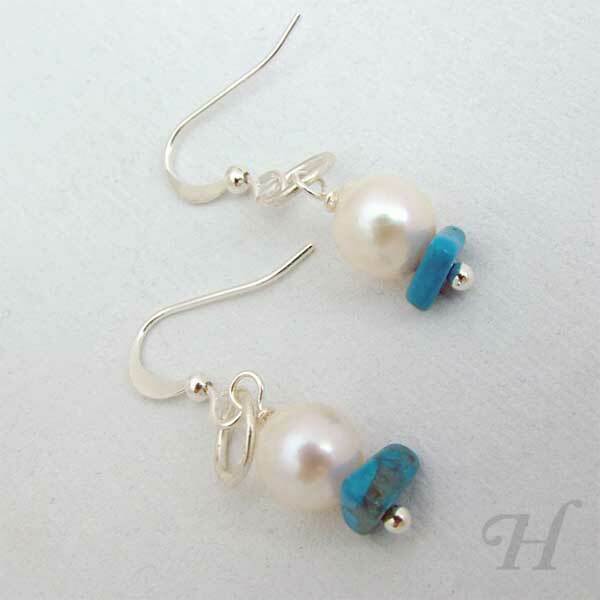 For more creations, drop by my ClearlyHelena Jewelry & Handmade Store and have a little browse around.